Advances in Cancer Immunotherapy™ – Portland, Ore. This program has already taken place, to find information on upcoming programs, please check here. Credit information to be announced. Click here for more detailed CME, CNE and CPE information and program objectives. Presentations include time for Audience Response System (ARS)-assisted audience interaction as well as general question and answer time. What’s Next for Cancer Immunotherapy? Attendees will also have an opportunity for connecting with regional experts in the immunotherapy field at the live event, through four quarterly webinars, and indefinitely through a dedicated online community forum. These connections will serve as ongoing resources while clinical oncologists and other healthcare providers incorporate immunotherapy into practice. The 2018-2019 Advances in Cancer Immunotherapy™ series is brought to you in collaboration with the American Academy of Emergency Medicine, the Association of Community Cancer Centers and the Hematology/Oncology Pharmacy Association. Participation in this free online pre-program course is strongly recommended as it contains information that will not be covered at the program on February 21, 2019. 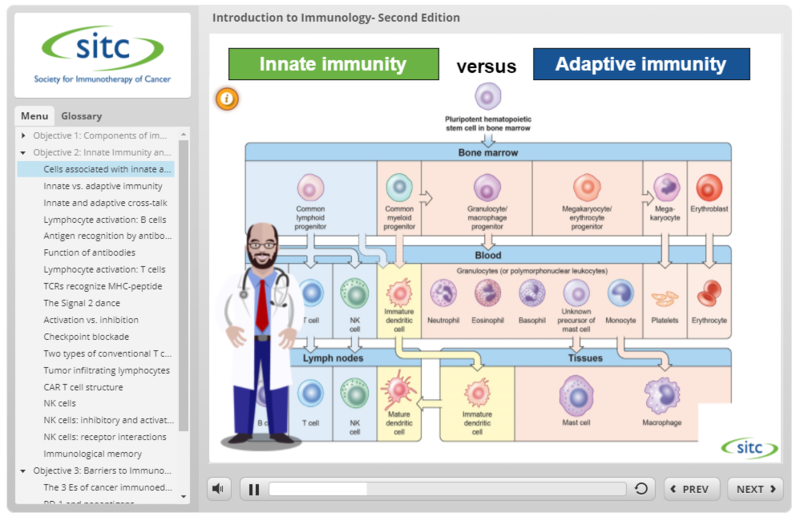 This updated, interactive course provides foundational knowledge that is necessary for understanding cancer immunotherapy content that will be discussed at the in-person program. Upon completion of the course, participants can earn continuing education credits (CME, CNE and CPE credits are available).